Nettie Wakefield with "Brandy 2"
London based artist Nettie Wakefield has built a career off of exceptionally detailed textural works in the medium of graphite and paper. Her subverted portraits highlight a sense of warped nostalgia with details pulling viewers into the sublime delights of endless depth. For her show entitled Brandy, at the Jason Vass Gallery, the focus was placed on portraits of a blow-up doll named Brandy. At just under 5 ft. tall she is young, pigtailed and will be used until replaced. These drawings were accompanied by 2 sculptures of Brandy in bronze. 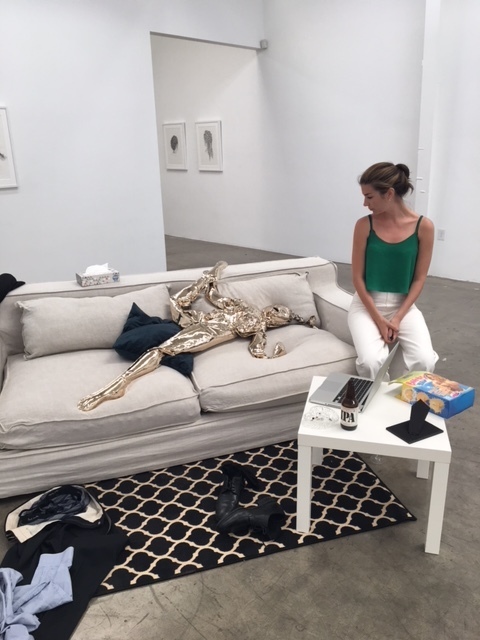 One sculpture elevated on a wall in a conventional manner, while the other lives in a bro'ed out installation placed on a couch, clothing strewn around, cigarettes and beer opened and ready to be consumed. We caught up with Nettie to talk about her show and going into a tangible state. What is it about Brandy that is able to have such a far reach with innocence and deviance, is it about the familiar aspect of such an image and the confrontation with it? Everything is open to interpretation and whatever you feel from it is personal to you but definitely, there is an innocence. Mainly due to the plain fact that she resembles a child. Big wide Disney eyes, deer in the headlights, and blond plaits and being only about 5 ft. tall. The deviance in it I suppose is her one and only purpose, to be used for something very adult indeed! How did you get into sculpting with Bronze, how has it been adapting your visual technique from graphite to 3d forms? Working with sculpture is something I never considered before or even knew I was interested in. I've always been so focused on drawing. When I was doing my residency at Banksy’s Dismaland, I met a couple of LA artists who were also present for the whole 6 weeks (I was just there on weekends) So we formed a bond. When I was in LA shortly after for a group show we reconnected and I got to visit their amazing studios and see all the wonderful work they created. One of them works specifically in bronze. At this stage, Brandy was just a pencil drawing but I could suddenly visualize her crumpled self as a polished bronze statue - and that was it. Started preparing the cast and nine months later she became 3d. How has the LA audience taken to your work compared to the UK audience? I'm looking forward to hearing what LA thinks! I've had some very appreciative messages from the people who attended the opening over Instagram so that's encouraging. How has LA affected the way you work and the themes you are exploring? I think LA was the perfect place to showcase Brandy for the first time. I started working on the drawings of her in 2015 and the show came out shortly after the #metoo and #timesup movements so it certainly seems more relevant. Especially at the source of where it all began with Harvey Weinstein. What was your process in the way they were installed? I had two identical sculptures so I wanted to create this dichotomy of the beauty of the sculpture in itself as an art piece but also its dark symbolism. Brandy 1 is hung on the wall where viewers are able to touch it with white cotton gloves whereas Brandy 2 is situated in a diorama on a sofa surrounded by accoutrements showing evidence of our mystery man after use: a laptop, recently removed suit with paul smith underwear, half-eaten pizza, tissues and brandy’s original box. He's perhaps not the kind of individual you would imagine to use Brandy but a more refined version who perhaps seems unlikely on the surface. When I found myself looking at her in that situation, I suddenly felt voyeuristic and somehow involved and complicit in her violation. Even though I was the one who created the installation it still didn’t sit comfortably with me to look at her. Brandy is made for a specific purpose and therefore doesn’t have a choice in being complicit in her own violation. Congrats on the show what is next for you?